Kambra Brawner, a California native, lives in South Dakota with her partner Colton on a ranch on the great plains. She loves everything about raising ducks, gardening, cooking, and DIY. Along with Colton’s family, they run a cow-calf operation specializing in black Angus. Kambra moved to the ranch about eight years ago. She met Colton when they were in their early teens at a trap shoot (clay target shooting) and have been close ever since. In 2010, they decided to create a life together, and within a year, she moved to South Dakota. The South Dakota Ranch was quite a contrast to her San Diego upbringing. “Living out here has been an amazing adventure, even with the hard times during the winter, the long days of fencing, or the times when I become a midwife to our pregnant cows…but the feeling is gratifying,” states Kambra. The opportunity provided by living out in the country prompted Kambra to want more than just cattle. She began gardening and engaging in other DIY projects but ultimately wanted to add another beneficial animal to their homestead. She started researching about raising chickens and ducks for eggs. After a year of careful research and consideration, she decided to raise natural, free-range, pasture ducks. In many ways, raising ducks is more convenient than raising chickens. Ducks are more tolerant of heat and the cold. They require less housing and they lay more eggs. “Ducks are a great addition to the garden for pest control and ducks don’t scratch like chickens, so they are very easy on your property. It’s all a win for us!” says Kambra. Alongside the coop, they built an attached run that is 100% predator proof. Protecting the ducks from predators is a top priority. “Here on the prairie we have a handful of predators including weasels, raccoons, bobcats, fox, hawks, eagles, coyotes, ranch cats, and dogs, so I wanted to be able to leave the ranch knowing my ducks are safe and sound,” explains Kambra. By the fall of 2017, the ducks started to lay their eggs. “We were thrilled and excited to be able to walk out our back door, collect eggs, and within minutes be eating an amazing breakfast,” states Kambra. The ducks kept laying eggs through the rough northern winter. At the start of this year, their Little Coop On The Prairie became the local source for duck eggs. Kambra says “After a few months of raving about my flock and their eggs, people began asking questions about raising ducks and especially about their eggs.” She gave out samples and it was an instant hit. Word of mouth spread and Kambra quickly had an initial base of clients. The coop now boasts thirty ducks—twenty-two ducklings and five layers. Just this spring, they added a second coop and are currently working on their new run. “One asset that keeps the work a bit easier around the coop and garden is having a Gorilla Carts® Cart. I honestly do not know how I got anything done in the past without one,” says Kambra. After spending years carrying heavy loads across the property, she researched some utility carts and ended up finding Gorilla Carts. She purchased the 1,200 pound capacity GOR6PS (-C) model off of Amazon. This model has the dual function handle, so she can either pull it around by hand or hook it up to a four-wheeler. 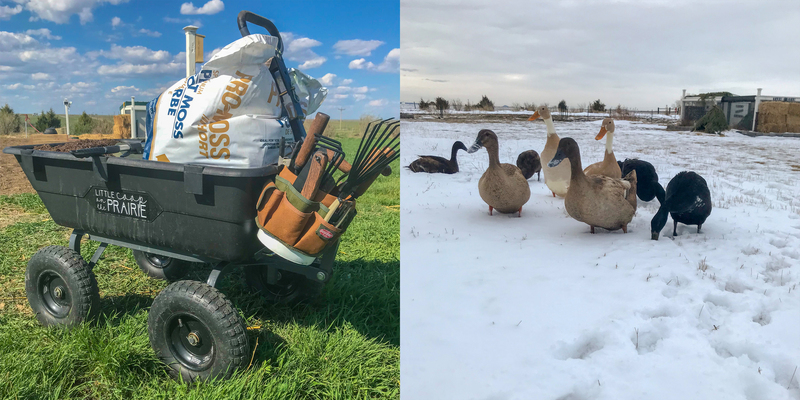 For rugged and sometimes bleak terrain like the South Dakota great plains, a Gorilla Carts Cart is the perfect tool to make life (and raising ducks) just a little bit easier.